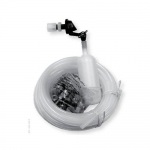 Savio Auto-Fill Kit for Waterfall Well Maintain optimal water level with a regulated flow of water. Self tapping valve connects to copper, plastic or iron water supply lines up to 1" in diameter. Includes 25' of 1/4" line.